Wheatgrass Juiceis made from the cotyledons (seed leaves) of the normal wheat plantTriticum aestivum. It is usually sold as a juice or powder concentrate. The difference between wheat grass and wheat malt is that wheat grass is left to grow for longer until it reaches the Jointing Stage, where it has peak nutritional value. It is then freeze-dried (i.e. at a low temp) or served fresh. In comparison, standard wheat malt is harvested earlier and then dried at a higher temperature. Wheat grass therefore manages to produce, and maintain, ahighly nutritious contentcompared to normal wheat. Consumers of wheat grass report that their levels of energy greatly increase, their skin clears up and illnesses, coughs and allergies are alleviated. Offered by us is a prime range of Organic wheatgrass Juice for our valued customers. These products can be availed from us at most reasonable prices. Our offered product is a natural blood purifier and helps to activate spleen and liver. Apart from this, these are checked on numerous parameters by our quality controller team in order to deliver flawless range at clients end. Wheat Grass Juice With Honey Flavoris an effective healer because it contains allmineralsknown to man, andvitaminsA, B-complex, C, E, l and K. It is extremely rich inprotein, and contains 17 amino acids, the building blocks ofprotein. 3. Wheatgrass juice contains up to 70% chlorophyll, which is an important blood builder. To Get Rid of AllSkin Problems Wheatgrass juice contains both vitamins and natural phytochemicals such as flavonoids, which are known to be antioxidants. To Avoid Hair Damage To Shed Those Extra Kilos Wheatgrass Juices To Keep you Healthy Wheatgrass Juice to Prevent Number of Diseases. 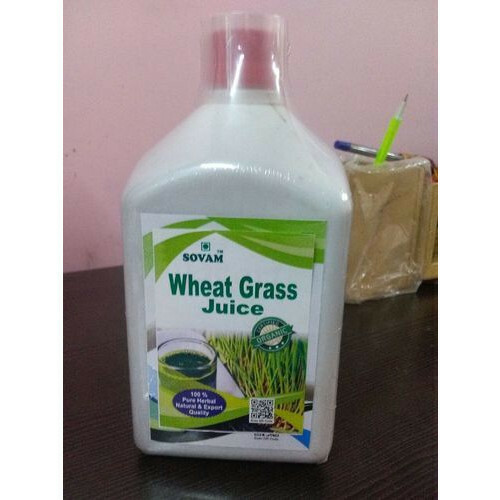 Wheat Grass Giloy Tulsi Juice is Helpful in Digestion, acts as natural blood purifier, provides an immediate source of energy, helps make a important contribution to a well balanced diet. It is also known to be useful for joint, Diabetes & Weight Management. Enhances resistant power of the body. Tone up the function of liver and many more. Increase red blood-cell count and lowers blood pressure. It cleanses the blood, organs and gastrointestinal tract of dibris. Wheat Grass also stimulates metabolism and the body's enzyme system by enriching the blood. It also aods in reducing blood pressure by dilating the blood pathways throughout the body. Stimulates the Thyroid gland, Correcting obesity, Indigestion, and a host of other complaints. Restore alkalinity to thge blood. Wheat grass Juice, Giloy Juice, Aloevera Juice & Panchtulsi Extract. Contains Permitted class II- presservatives. 20 to 30 ml Twice a Diluted in 100 ml water.